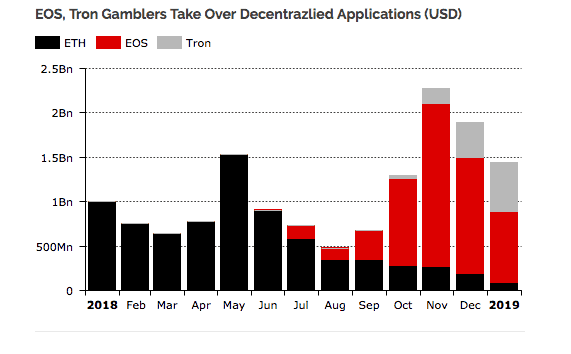 “Decentralized apps” (dApps) built to run on newer cryptocurrency blockchains Tron and EOS have steadily taken over from Ethereum as gamblers’ financial media of choice, DIAR reports. Ethereum still processed $7.6 billion in dApp transactions in 2018, but this was mainly business coming from trades conducted on so called “decentralized exchanges” (critics have panned the idea that exchanges can be truly “decentralized,” meaning controlled/run by no particular individual or group). Collectively, Ethereum, EOS, and Tron handled $13 billion USD in transactions in 2018, says Diar. In January 2019 alone, the three chains reportedly processed $1.5 billion. 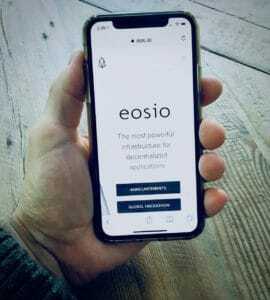 This means that EOS now processes 55% of all business done on dApps. Part of EOS and Tron’s success in eclipsing Ethereum may have resulted from many investors jumping to invest in them last year because Ethereum’s multi-X growth had started to calm. TRON and EOS gambling dApp’s may also be being used to launder dirty funds. A large amount of “chips” can conceivably be bought on a gambling dApp, a small number of bets placed, and then the bulk of the chips can be cashed out for “fresh” crypto. 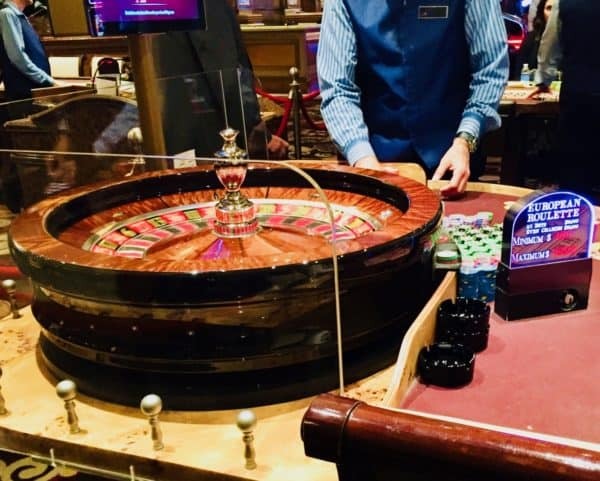 The Canadian province of British Columbia has been trying to sort out casino related money-laundering problems for some time, problems some politicians and journalists believe have contributed housing unaffordability and an opioid crisis in the region.